Motherhood is hard enough on it’s own. Throw a business in the mix and you potentially have a recipe for disaster. I often felt like when my business was thriving, my kids were feeling neglected. And when my bond with my kids was at it’s strongest, my business could be found hitch-hiking on the side of the road looking for a new owner. Needless to say, I became accustomed to being the hot mess mom – who fueled only by coffee and the fumes of my kids’ energy – was constantly struggling to stay above water. I contemplated whether or not I should continue my wedding photography business (basically my first child), but I knew I couldn’t give up on something I was so passionate about. As a result, I spent much of last year searching for that enigma we call balance. Spoiler Alert! It’s impossible! 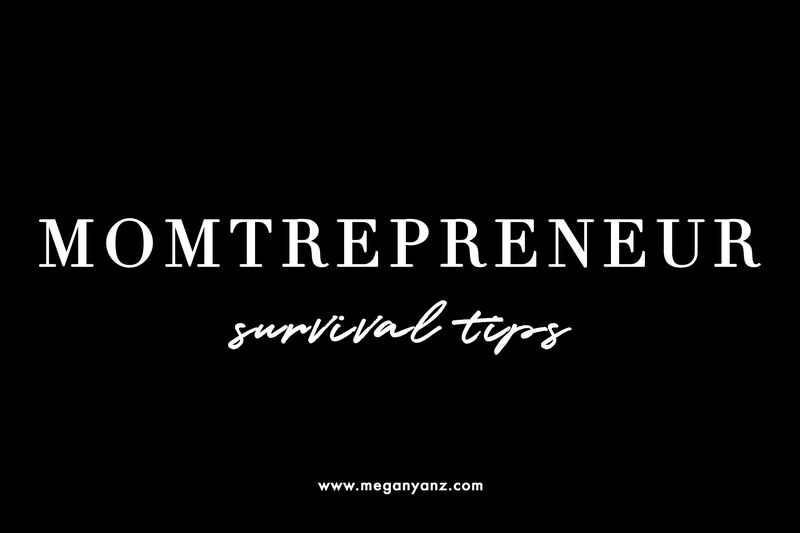 But here are some momtrepreneur survival tips I’ve found to be helpful along the way. Girl, if you are not using quickbooks, get. on. it. True story, there was a time when I would input all of my accounting once a friggin’ year. I’d have my receipts and invoices in one big manila folder, and then I’d enter them all into a spreadsheet of organized chaos right before taxes were due. It was my designated worst week of the year. Like it could have had it’s own holiday. It was the one time of the year when I hated my job, hated myself for procrastinating and wanted to Office Space my computer. I’d tell my husband I was quitting, and he’d ask me why I don’t just enter transactions as they happen. BECAUSE WE HAVE KIDS. That’s why. Then I discovered Quickbooks. Now I quickly login each morning while the boys are eating breakfast and verify my transactions. Takes me a whole 2 minutes. And come tax season, I don’t hate my life anymore. Unless you’re actually in the business of accounting, chances are you have no idea whether to be a LLC, a sole proprietorship or whatever else you’ll want to call yourself. Do you know how much to set aside for taxes, or even when to pay them? Do you know the rules and regulations regarding sales tax? And did you know they’re different for every State? It’s confusing and not worth the legal ramifications when you get audited. Just hire an accountant, guys. I can’t tell you how much my laptop has saved me this year. Invest in a portable computer. I used to do everything from my desktop computer in my office. But after our second child came along, my office time was pretty limited. With my laptop though, I can work whenever, wherever. I try to monitor how often my kids see me on it, because obviously if I’m preaching to them about screen time, I have to hold myself accountable, too. Now they take my threats seriously – because now I can see everything! The Mile IQ app is worth every Penney and more. The GPS feature tracks your whereabouts each day (slightly creepy, but we know they’re already watching) so you just have to verify whether your drive was for work or personal. I have an alarm set to remind me to classify drives every night before bed so I don’t fall behind. Dedicate specific times during the day to reply to emails, place orders, edit, run your business, etc. And turn off notifications! Especially for social media accounts. Don’t let those control your life. Kids > social media likes. I even went as far as to turn off messaging on my facebook business page. Every type of social media has it’s own messaging system, and for me, it’s just easier to direct all inquiries to one spot. Bottom line, you’re not a 7/11. Set boundaries. This is basically my electronic journal of word diarreha. Whenever ideas come to me (usually in the dead of the night because I don’t sleep), I jump on here and record them immediately. I really do use it for everything. Whether it’s an idea for a shoot, a timeline for a wedding day, halloween costumes for my kids, grocery lists, meal plans, to-do lists, etc. It’s my most used app. Another app I’ve heard rave reviews about is Evernote. One of the most time consuming parts of my job is how much I have to rely on social media to share my work and market myself. Cue whinny voice. Ugh… But I’ve learned that in my line of work, social media is the best way to reach potential clients. There are a number of apps out there that allow you to schedule posts in advance – BOOM! More free time with your kids. Hootsuite allows you to manage all your social media accounts in one place. Mosaico and Planoly are great for scheduling Instagram posts, but they also allow you to plan out the look of your feed. Consistency is key, friends. I also recently discovered Prime for Instagram which tells you the best time of day to post. Instagram now sends your posts out to only a sample of your audience. So if these people engage, Instagram decides your post is good enough to share with the rest of your audience. Basically, Instagram is sneaky and just like facebook, we never know what it’s up to. How many times a week do you feel like you need to refocus your energy? As a mom and a business owner, I constantly feel like I’m being pulled in a thousand different directions. It can quickly become overwhelming. Whether my workload is insane, my kids are driving me mad or I’d just like to start my day off on the right foot… I fall back on this meditation app, Insight Timer. You decide how long you have and what you want help with. I.E. sleep, stress + anxiety, creativity + performance, happiness, spiritual, relationships, etc. And then you sit there and you listen. It’s a phenomenal way to practice mindfulness. I even use the kids guided meditations for help with bed-time. Myself and my oldest absolutely love this app, and it’s FREE. While I use my phone’s calendar for my own peace of mind, it’s important to me that the rest of my family knows what’s happening on a day-to-day basis, too. We have a giant hand-written calendar hanging on our pantry door that my oldest son can read, and my husband can also add to. This one has errything. From the kids’ activities, to mine and Justin’s work schedules, to wedding and photo session due dates… That door knows more about our lives than we do. I hate meal planning so we tend to have a routine when it comes to dinner time at home. I use the slow cooker at least one day a week when I know our after-school life will be too chaotic, or I just have too much work that needs to get done that day. Bonus, it usually makes a meal that’s large enough for leftovers. The boys love to help me make pizzas on Friday nights, and the other nights are usually designated American, Italian, Mexican themes. Speaking of routine ^… It took me a long time to accept that life is easier when my family dedicates certain days to certain jobs. I tend to have days where I’m super motivated and productive, and then I have days where I don’t want to do a thing because of my over-productiveness from the day before. Like when I realize I haven’t slept in 24 hours. It helps me balance work and life at home when I stick to a routine. Monday is laundry day. I vacuum every Wednesday. Sunday is the only day of the week my husband and I both have off, so we save it just for family. You get the picture. But set some kind of routine up with your partner and kids and you’ll all be happier! I’d love to say I never go to bed unless the kitchen is clean, but let’s be real… half the time I start my morning staring at last night’s dinner on the kitchen counter. It’s a great feeling waking up to a clean space, however. Save yourself stress and anxiety and try to find that routine in your life. Something I’m still working hard at. No shame here. We can’t do it all. I’ll hire a maid service to do a thorough cleaning once (sometimes twice) a year during wedding season. We live pretty simply, but man… wedding season consumes me. Maintaining a home falls to the bottom of the priority list month after month, and sometimes it becomes too much. Luckily the kids are getting to an age where they can pitch in more, but if yours aren’t there yet, it’s okay to ask for help. The best thing ever. I’m no stylist, but I hear it’s not great to wash your hair every day either. I also can’t be in the bathroom for more than 30 seconds before someone comes storming in wondering if I died. Or to tell me that his brother is standing on the edge of a windowsill. Or because they can’t find their shoe – I clearly haven’t labeled the basket that reads SHOES in his room well enough. So sometimes I skip a shower completely. Probably more than I care to admit. But guess what, it’s not my hair that gives it away. It’s the mascara that I forgot to take off the night before. My friend brought these along while second shooting for me one day, and hello cliff bars… Where have you been all my life? The only time I really get to sit down and eat is at dinner. The other two meals are spread throughout the day when I have time and actually remember. I know it’s terrible, but I’m being honest. I always keep a few cliff bars in the diaper bag (when we had one), my car and my case that holds my gear. They’re packed with good nutrition so I can feel a little bit better about skimping on meals. I think many of us are accustomed to a life style that provides us with immediate gratification. Growing a business doesn’t happen over night. Neither does the art of raising young ones. Thank god. Be patient with your little ones, yourself and your business. Don’t take on more than you think you can handle. Learn how to say no, and be a little bit selfish. Your time is more valuable now than it ever has been. Give yourself a break. No one’s perfect. Maybe you forgot to pack a lunch, or were late to baseball practice. Maybe you sent your kid to school in pants he grew out of two seasons ago. Guess what, he’s still alive. And chances are he’ll never remember. Forgive yourself and move on. Don’t feel guilty about working either. I personally think it’s great for your kids to see you chase a dream and make it happen. Now give yourself a high five and a loud reminder that you’re doing a great job. Get on the damn floor and play with your kids. Turn off your computer. Silence your phone. And have some quality time with these little buggers every single day. Make memories! Because this is time you won’t get back. Sometimes we just need that gentle reminder, family first. Find someone in your actual line of work that you admire, who offers mentoring AND has kids. Ask what has worked for them and what hasn’t. Ask about their business strategies and how they balance their everyday. I think you’ll find you’re not alone in this struggle, but there are little things you can do each day to make working from home while raising little ones a wee bit easier. I know some of you might be asking why don’t you just get a nanny? For some of us, that’s out of our budget. And for others, we just don’t want to. And you know what? That’s okay! You can manage both! It’s work and extra effort, but worth it. Most days. Congrats. You made it through another day. Finally! Someone that completey understands and even put it to screen. This is my life. So great to know I’m not alone. Kudos to you, girl… keep it up because you’re so much more on top of it than you probably think. You’re definitely not alone, Kristen! The struggle is all too real… Thanks for your comment! I’m right there with you all! Mamahood is no joke when you add a business in! I totally agree about the Notes app and slow cookers—I need all the help I can get!